One of the best metaphors for describing a website is the world of books. What is a Website? What is a Web Page? A website is made up of a series of web pages. In this way, a website can be thought of as a book, and a web page like the page of a book. You usually only read one page of a website at any one time (similar to how you read a book). A website also has a homepage which is like the front cover of a book. 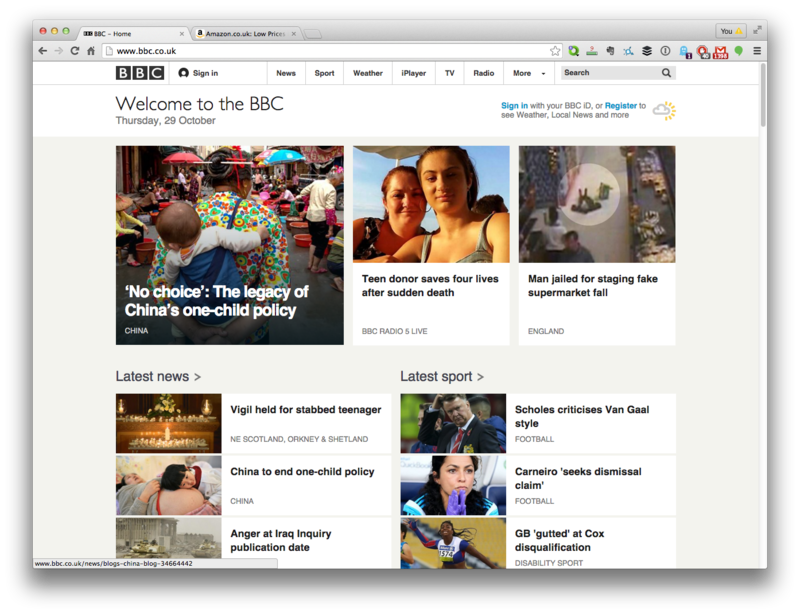 The BBC homepage is displayed below. The homepage is being displayed inside a browser called Chrome. This particular version of Chrome is running on a desktop computer (it will look smaller and a little different on a smartphone or tablet). In order to view a website you need a tool called a web browser. There are two tabs in the example shown. The one on the left contains the BBC Homepage and the one on the right contains a web page from Amazon. The BBC Homepage is the currently displayed website as it appears to be nearer to us. The tab on the right appears behind our currently selected tab. If you clicked on the tab on the right then the Amazon website would be displayed in the web browser instead. The arrow pointing to the left is known as the back button. The back button will take us to the last page we visited before the one currently displaying. The arrow pointing to the right is the forward button. If we click (or press) the back button it takes us to the previous page visited. If we then click (or press) the forward button it will take us to the page before we pressed the back button. So it does the opposite of the back button. This looks like a circular arrow. Sometimes a web page doesn’t display correctly. In these cases, it can be useful to click the reload button. This looks like a house. If you click (or press) on it it will display a pre-chosen website. It is usually used to display the website you visit most. This might be a news website or it might be a search engine. Some people even set this as their email page. The address bar contains the website address, in the example, you can see www.bbc.co.uk. If you type a website address (also known as a URL) into the address bar and press enter then the web browser will display that new website. When you clicked (or pressed) on Click Here above, you were clicking on a link. A link takes you to another web page when you click or press on it. A link is often blue and underlined, but it can be any colour. Usually, most text of an article is black or grey, and coloured text (sometimes underlined) are links. Links are useful as they help us navigate a website. They are also useful because you can email a friend a link, which means they can read the web page you want them to read.